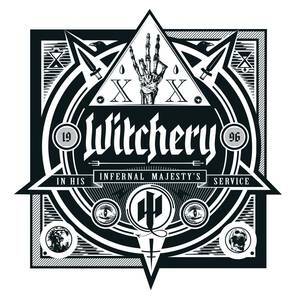 Blackened thrash metal supergroup Witchery return after a six year absence with its sixth hellish offering, In His Infernal Majesty’s Service. “Lavey-athan” storms from the abyss like a demon ready to devour innocent souls. The track is full on thrash with chainsaw guitars and punkish drumming. The stomping midsection gives way to an eerie clean guitar and a whispered verse before ending on a heavy note. The chaotic “Netherworld Emperor” is a pugilistic track that strikes from all angles. New drummer Chris Barkensjo showcases his skills here as the track has several time changes but maintains a consistent groove. “Nosferatu” is the initial single and one can see why with its galloping riffs and frontman Angus Norder’s shrieking vocals. The band’s black metal roots show on this track with its dissonant riffs and the atonal guitar lead. Things speed up on “The Burning of Salem” which recalls early Slayer. The suffocating riffs sound like a fiery whirlwind while the drums manage to keep up. The apex of the song is during the middle when we hear a man identifying himself as Salem’s magistrate sentence several defendants to death by hanging. History certainly comes alive on this track. A haunting organ opens up “Escape From Dunwich Valley”which grooves from start to finish. Guitarists Jensen and Rikard Rimfalt put their stamps on this track, as this track as a major Black Sabbath vibe. In His Infernal Majesty’s Service main strength is the diverse songwriting. The band draws from death, black, death and even doom metal to forge some unpredictable but dynamic songs. Witchery refuses to play within any parameters, but can play in the pocket when necessary as seen on “Escape From Dunwich Valley.” Musically, the band members all hail from some of metal’s most revered bands. Bassist Sharlee D’Angelo plays in Arch Enemy, guitarist Jensen plays in The Haunted and lead guitarist Rikard Rimfalt played in Seance. These guys can play melodic metal or straight thrash at the drop of a coin. We see this throughout Majesty and it gives the record an extra kick. The six year absence certainly has not dulled Witchery. In His Infernal Majesty’s Service would please the Dark One as only Witchery can do. It is pure blasphemous heavy metal that rarely lets up. Fans of the band member’s main bands should pick this up as should fans of extreme metal. The road to hell is paved with good intentions and this is the soundtrack for the journey.